There’s a scene in “American Psycho” where psycho-in-question Patrick Bateman (Christian Bale) and his colleagues compare business cards. To the viewer, the cards look identical. It’s only through the group’s discussion and Bateman’s inner dialogue that we learn the differences: colors on the white spectrum, typeface, paper weight, watermark. How would Patrick Bateman respond to Vistaprint? I found Vistaprint last year through 10,000 Words, one of my favorite journalism blogs. The entry suggested that journalists were moving away from identifying with an established company (say, their newspapers or stations), and further toward identifying as one-man (or -woman) operations. Faced with no longer having a newspaper with which to identity, I’ve spent much of the last year and a half cultivating my own personal brand. I tweet all the time, I blog and I follow a variety of people and news organizations. I redesigned my CV and made sure to join emerging social networks. And I made a business card. While it’s been a few months since I did this, I thought now — in the midst of post-graduation job-hunting — might be a good time to describe my process. 1. I browsed Cardonizer, looking for inspiration. The examples on Cardonizer vary from the chic to the absurd, but all are eye-catching. 2. I decided what information I wanted to include. I settled on my email, phone numbers, website and Twitter handle. I also decided to list my basic job titles/attributes, from the more serious (copy editor) to the more personal (traveler). 3. I “sketched” a rough layout in InDesign. One card I’d seen had used icons, so I decided to make my own. I painstakingly drew a cursor (website icon), an envelope (email icon) and two mobile phones (phone icons), and found a black Twitter icon. I placed all of my icons in the middle of squares with rounded edges, to make them look like buttons. 4. I selected a color palette. In addition to black for the text, I used the same cranberry-blueberry-lime combination that I’d chosen for my magazine prototype. 5. I added the text and chose a typeface. The contact information is prominently featured on the right, while my professional/personal attributes are lined up along the bottom, separated by colored vertical lines. I selected Merge for my typeface, a clean, slender sans serif that looks modern without being too cold. 6. I created my own “logo.” In my case, I drew a piece of notebook paper in one color (cranberry) and splashed a big “STET” across it in another color (blueberry). My name appears within a lime-colored dialog box, in black text. 7. Because Vistaprint lets you use both sides of the card, I selected a photo of mine for the back (Tower Bridge). I captioned the photo with a simple cranberry-colored bar, with white text. 8. I saved and exported both sides of the card and went through the motions on Vistaprint. I selected my order volume, chose a paper color and weight and cropped the graphics to fit the appropriate frame. Once I was satisfied, I ordered my cards. Voila. The hardest part for me was settling on a design. It may be easier to use a template, but there’s something rewarding about making your own card from scratch. I know that mine’s unique, and love that it’s zippy and colorful while still being informative. 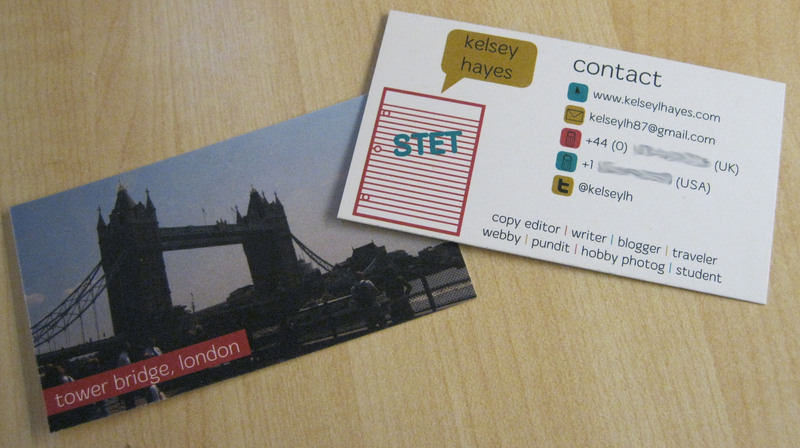 So if you’re thinking about making your own business card, knock yourself out. Chalk it up to bolstering that personal brand. With my degree somewhat winding down (even though I still have about three months to go), I’m starting to look at and apply for grown-up jobs. It’s somewhat scary, given that I’m on a bit of a race against the clock. Eventually I think I do want to study for a PhD, but I feel like I need to get some professional work experience first. I’d like to work in some sort of writing or research capacity, but at this point I’m not picky. I have a wide variety of jobs bookmarked — mostly in the U.K., a few in the U.S. to keep my mother happy. Some are journalism-related, others are more about public relations, a few are research posts. I’d love to stick with government or politics in some capacity, but that might be a tall order for the immediate future. The important thing now is getting my foot in the door and paying for rent and my work permit expenses. One great thing about having a journalism degree is that I will always have the ability to write and edit skillfully. I have critical thinking skills and a researcher’s mind. I have mad skills with InDesign and CCI (and I’m not even Danish). I know a lot about a wide variety of topics — history, art, politics, sports, popular culture, economics. And I’m a workhorse with a sweet business card. Wish me luck. And also, if you’re hiring, please let me know.